The fourth Industrial Revolution merges the physical, digital and biological worlds. The need for human connections has never been greater. Companies can find talent. They just can’t attract it. Fifteen years ago, corporate was king, and bigger was better. Companies such as Bank of America, Qualcomm, Cisco Systems, Intel, Sun Microsystems and Merck were top companies desired for employment. That mindset has evaporated. Today Stryker, Baptist Health South Florida, Workday and Genentech are among the 100 best companies to work for, according to Fortune Magazine. Worker preferences are changing. It’s no longer good enough to tout social responsibility and entice talent with the sparkle of high earnings. Employees want flexibility and inclusion in decisions affecting their future. Companies are fracturing, and disintermediation isn’t only an outside force pressing upon companies, it’s a force creating disruption inside-out. Today's workers are looking for a corporate family, a group of like-minded individuals that share beliefs and hold similar values. Business is getting personal. Large enterprises aren’t able to complete. According to the MIT Sloan School of Management, the roles of startups and big business are shifting. In 2016, 15 to 20 percent of MIT graduations join startups. According to Vladimir Bulović, associate dean for innovation and a professor at MIT. Interestingly, 10 years ago only about 1.5 percent joined startups. The primary reason for the swing is that innovation has shifted to smaller companies. These little companies house tight groups of individuals who are committed – the seduction of the modern startup. Low pay, horrible hours, with a slight chance of changing the world. Interested? The influx of freelance and contract workers into corporate America is changing the landscape of work. Job polarization, although a relatively new economic term started with an investment in robotics, removing middle-skills jobs relocating many jobs overseas. The effect of job polarization has resulted in a sharp reduction of middle-class jobs. These jobs are classified as moderate-skill level when compared to low-skill and high-skill jobs. When observing the index of computing over the last thirty years, there have been tremendous advances in computer power, cost per unit, labor cost per unit, cycles per second, and rapid memory. 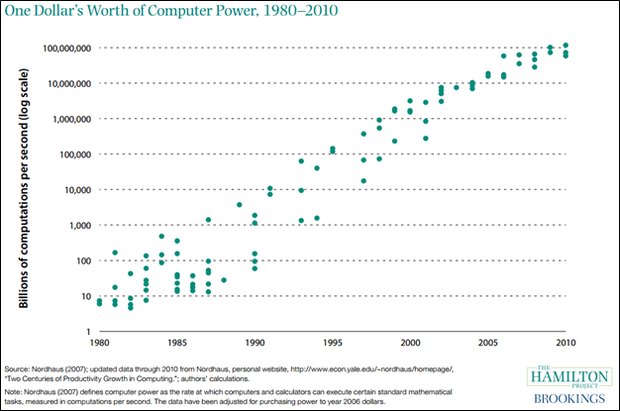 Significant growth in computing power, performance, and productivity growth began in the mid-1940s. Moore’s Law observed in 1965 by Gordon Moore, co-founder of Intel, started a trend that would last for decades. This surge in productivity accelerated during 1969 to 2004 when the price index for computers fell by 23 percent about the GDP price index as presented by the Bureau of Economic Analysis (BEA). The Future of Work in the Age of the Machine, by The Hamilton Project, illustrates the exponential gains in computer buying power between 1980 to 2010. American Economic Review published, the paper titled, The Growth of Low-Skill Service Jobs and the Polarization of the US Labor Market by David H. Autor and David Dorn. Their hypothesis found that “a critical role for changes in labor specialization, spurred by automation of routine task activities, as a driver of rising employment and wage polarization in the United States and potentially in other countries.” The structure of jobs is changing. Jobs are moving away from middle-skill roles and branching toward low-skill and high-skill roles. The future of work is also broader than collaboration technologies. We are on the brink of a new industrial revolution. The first Industrial Revolution was driven by steam and mechanical production equipment in 1784. The second Industrial Revolution was the mass production of electricity and divisions of labor in 1870. The third Industrial Revolution automated production with electronics and information technology in 1969. What will be the fourth Industrial Revolution? The Internet of Everything (IoE), robotics, sharing economy, cyber-physical systems, nanotechnology, biotechnology, materials science, energy storage and quantum computing all compete for the new title. Whatever it is eventually labeled, the fourth Industrial Revolution merges the physical, digital and biological worlds. The need for human connection and the necessity to manage public and private information has increased in signal strength as this revolution changes society. With virtually unlimited possibilities business model shifts are occurring across every industry. How we work and communicate is undergoing a profound paradigm shift – asking every member of society to rethink their values and goals.